Life as a student is busy. Classes, exams, sports, friends, and family all keep you on your toes. With your schedule so tight, we’re always looking to save you time and money here at Cash4Books. When you make an account and get a price quote on your textbooks, those books stay in your cart. You can come back any time and sell them instead of inputting those long ISBNs again. For the first 48 hours after you price your books, your quote will remain the same. After that, it will update to the most current price available. Prices change based on demand for your book, time of year, and other external factors. Price your books at the beginning of the semester and check back in for new updates. These price checks also let you see which books will be worth the most for resale. You’ll know which ones to take extra good care of and which ones you can highlight and take notes in. Need help keeping your books in pristine condition? Check out these tips to keep your textbooks like new. We’ll also send you emails now and then with updated book pricing to let you know how much you can get for your textbooks. 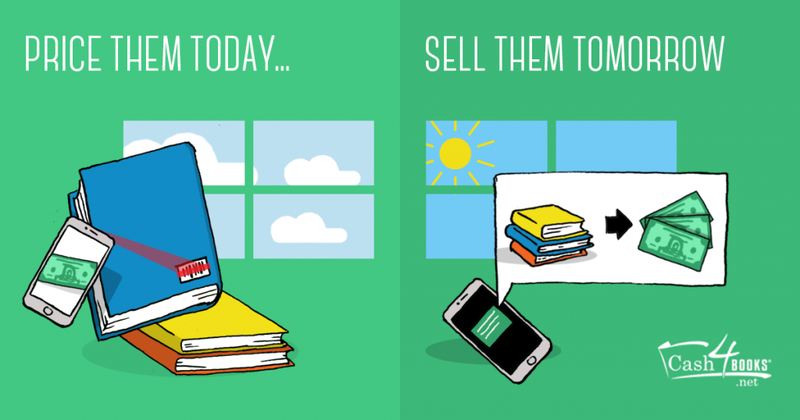 Price your books today and sell them tomorrow for more money! Need to save more time? Download our free Cash4Books Apple or Android app and price your books on the go. Instead of inputting ISBNs, you can scan the barcodes of your books and instantly see how much they’re worth. If you’re in line at the school bookstore waiting to sell your textbooks, take a moment to check the prices from Cash4Books before you sell. You could snag a major deal! Ready to get a free price quote and get those books off your back? Head to our home page. This entry was posted in College Students and tagged Cash4Books News & Updates, college students, make money, Save money, sell books on February 24, 2016 by Jim McKenzie Smith.